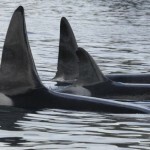 You are here: Home › Orca › Sightings › Stranding and resighting! Putita, the male orca who stranded at Ruakaka in May 2010 has been resighted only days later and still with the orca (Yin, his presumed mother and Rua his presumed brother) who waited for him in the surf whilst he was being rescued. They were all spotted travelling North, together, as they went past the Orca Research Center on the Tutukaka coast!